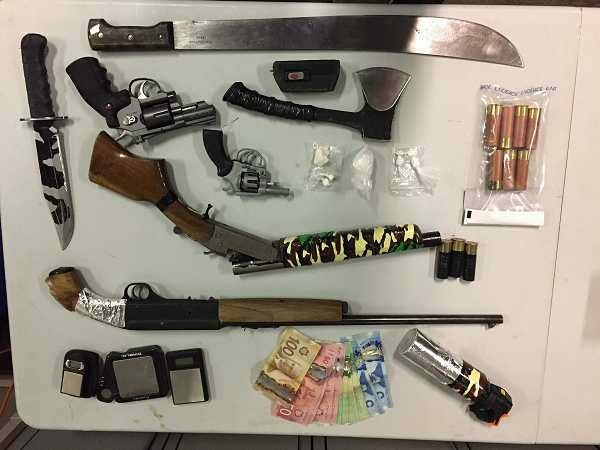 Prince Albert, Saskatchewan – Three people are facing weapons and drug related charges after an Integrated Street Enforcement Team (ISET) investigation Thursday. On February 7, 2019 just before 9:00 p.m., ISET members executed a search warrant on a residence in the 800 Block of 15 Street West. After searching the residence and a vehicle associated to the residence police seized a sawed off 22 caliber rifle, 22 caliber handgun, loaded sawed off shotgun, assorted knives and machetes, homemade taser, various ammunition, drug paraphernalia, 24.4 Grams of cocaine and 1.1 Grams of methamphetamine. After searching the residence and a vehicle associated to the residence police seized a sawed off 22 caliber rifle, 22 caliber handgun, loaded sawed off shotgun, assorted knives and machetes, homemade taser, various ammunition, drug paraphernalia, 24.4 Grams of cocaine and 1.1 Grams of methamphetamine. A 25-year-old female from Prince Albert and 26-year-old male from Montreal Lake are both facing 20 charges related to firearms and drugs (Info # 991080852). A 16-year-old male youth from Montreal Lake is charged with possession of a firearm without a license, obstruction and breach of court order (Info # 991080856). All three accused will make their first court appearance today. The Integrated Street Enforcement Team is made up of members from the Prince Albert Police Service and the Royal Canadian Mounted Police.